Game Preview: Bears at IceHogs, 5 p.m. 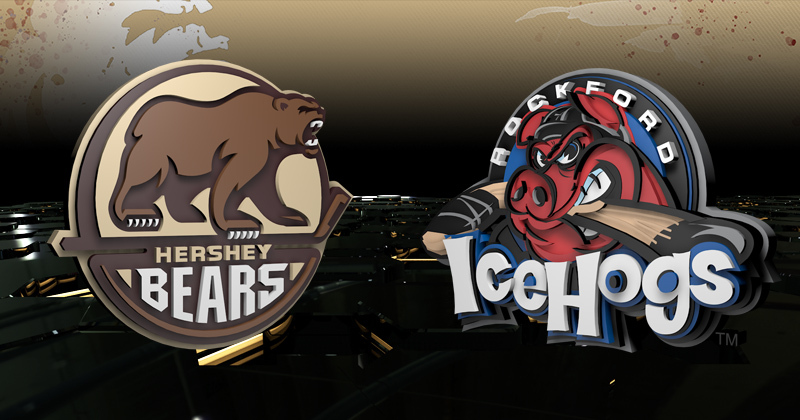 The Hershey Bears conclude their Midwest road trip tonight with a 5 p.m. tilt against the Rockford IceHogs. The Bears played Rockford twice last season and dropped both games, losing 5-0 on the road on Oct. 22, 2017, and a 4-3 overtime game on Feb. 24, 2018 at Giant Center. Hershey enters win-less in their first four games of the new season for the second straight year. The Bears spoiled Milwaukee's Troy Grosenick bid for a shutout in the third period, but ultimately fell, 5-1 last night to the Admirals. Down 5-0 in the third period, the Chocolate and White cracked the scoreboard on a goal by Derek Hulak in his Bears debut. Vitek Vanecek stopped 18 of 23 shots. Last night, the Rockford IceHogs earned their first victory of the season after a three goal explosion in the third period to top the Texas Stars, 5-3. Matheson Iacopelli, Dylan Sikura and Darren Raddysh all scored in the third period for the win. Tonight's game features a battle of the two youngest coaches in the AHL. Rockford head coach Jeremy Colliton, 33, is the youngest coach in the league and enters his second season leading the IceHogs. Last season under Colliton's direction, Rockford finished with a 40-28-0-8 record and advanced to the Western Conference Finals before knocked out by the Toronto Marlies. Hershey's Spencer Carbery, 36, is in his first year as an AHL head coach. Last season, Carbery was an assistant coach with the Providence Bruins, and has coached in professional hockey since the 2010-11 season with the Sound Carolina Stingrays. Tonight, Aaron Ness will skate in his 500th career professional game. Ness enters with 452 AHL and 47 NHL games on his resume. The veteran blue liner is playing his fourth season in Hershey and has appeared in 18 games with the Washington Capitals dating back to the 2015-16 season. Ness is a former captain for the Bridgeport Sound Tigers and currently serves as an Alternate Captain on the Bears. Last night not only marked Derek Hulak's Bears debut, but his first AHL game since Dec. 3, 2016. Hulak missed last season due to injury and signed with the Bears on an AHL contract out of training camp. Hulak's last AHL goal prior to last night's tally was on Nov. 23, 2016 with the Utica Comets against the Syracuse Crunch. Hulak is a former 21 goal scorer with the Texas Stars in 2014-15.